Back in the old days........when I was a young working woman, this week was known as Secretary Appreciation Week. Like everything else in the world today, in order to be fair to everyone, not insult or demean anyone, in order to include everyone and be politically correct.... this week is now appropriately called National Administrative Professionals Week. National Secretaries Week was organized in 1952. The name changed in 2000 when the IAAP (International Association of Administrative Professionals) announced the change to keep pace with the changing job titles and expanding responsibilities of the administrative work force. This day of observance always falls during the last full week of April. Secretaries Day always conjures up memories of one of my favorite bosses in my career, not just because he was thoughtful in observing this day of recognition, but because he, without intention, probably taught me the most valuable lessons in my working career. Not the least of which was not judging a book by its cover and not letting the opinions of others lead you to the wrong conclusions. Today I'd like to tell you about a very special man, Dr. Judd T. Gilmour. A while after taking the senior stenonographer exam, I received a canvas letter and interviewed for a position as a Senior Stenographer in the NYS Department of Agriculture & Markets in Albany. Both of my parents were State workers, so getting a job with the State was always the recommended career goal. After working for two years in the Admissions Office of Skidmore College, I took the Civil Service Stenographer test and got my first State job at Wilton Developmental Center where I met my husband, John. We both began our jobs there on the same day, went through 2 weeks of orientation together but didn't actually get acquainted and start dating until three years later. We'd been dating for just six months when my promotion opportunity came along. My interview had been with a panel of interviewers, one of which was an aunt of my childhood best friend. I got accepted for the position of Senior Stenographer to one of the Assistant Directors of Food Inspection Services. The Food Inspection division was very large. It employed a lot of folks, both in our office and in the field. It included a Director, two Assistant Directors, stenos, senior stenos, clerks, inspectors, etc... I don't remember the exact number of people in the office, but I'd guess there were probably around 30. My first day on the job my friend's aunt, who was in charge of the clerical staff, brought me around the office to introduce me to everyone. As each and every person heard that I would be working for Dr. Gilmour, each one took on a look of dread. Wide eyed and puzzled, one by one, each of them exclaimed, "You're working for Dr. Gilmour?" He didn't seem scary or intimidating in my interview. By around the tenth person I met, you can imagine the level of apprehension and concern I was feeling. What in the world had I gotten myself into?? I remember that day like it was yesterday - the dread I was feeling on my ride home that night and the discouragement I felt telling my parents about my experience. Of course there was nothing I could do, except face the fire and hope Dr. Gilmour wasn't as awful as everyone seemed to imply. I knew I had exceptional secretarial skills, so I would just have to prove myself to him--one day at a time. 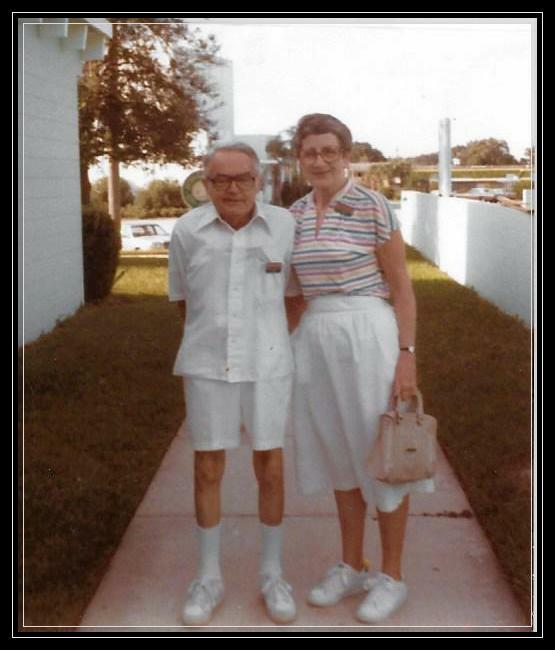 This is Dr. Gilmour and his wife, Myra, in 1983, three years after he retired. Emphysema caused his osteoporosis and a significant loss in height. Well Dr. Gilmour, it turned out wasn't nearly as bad as everyone made him seem. In fact, I really came to love him. He was a brilliant man, a retired veterinarian from Geneva NY who resembled what I would picture as the absent minded professor. He had straight, white hair that was almost always a little unkept, especially as he hurriedly shuffled into the office each morning. He was color blind, so he always wore a white shirt, black slacks, and a variety of sport coats. He had an assortment of bow ties which he kept in his sports coat pocket and desk drawer. It was not uncommon for him to confer with me about whether or not his chosen selection of the day matched his coat. Dr. Judd T. Gilmour was a business-first kind of guy. It was clear we were all there to do our job and do it well (perfectly well). He wasn't much for small talk, not from him and not between the staff. I quickly became best friends with the steno who sat next to me and Dr. Gilmore scolded us more than a few times for talking too much. Hard to believe, I know! In high school I had the highest 3 yr. average in a business major. I got the award for the highest number of words per minute in shorthand and typing, so when it came to doing my job, I felt pretty competent. That was a good thing, because Dr. Gilmour accepted nothing, and I mean nothing, less than the best. He was a stickler for perfection and he got it from me, no matter what it took. Back then a letter needing multiple copies required several sheets of carbon paper between each copy. One typographical error wasn't as easy to correct as backspacing is on a modern day computer. You had to erase the mistake on each copy, making sure you put cardboard or some other hard surface between layers so you wouldn't make smudges when correcting each copy. I was a fast typist, but not a perfect typist so there was no chance of letting a misplaced comma or typo sneak by. No, this was not acceptable to this boss. Although there were days that he drove me nuts with his insistence on perfection, I credit him with making me the best secretary I could be and have thanked him many times over the years for giving me the tools I needed to achieve success, not just in the secretarial field, but in life too. 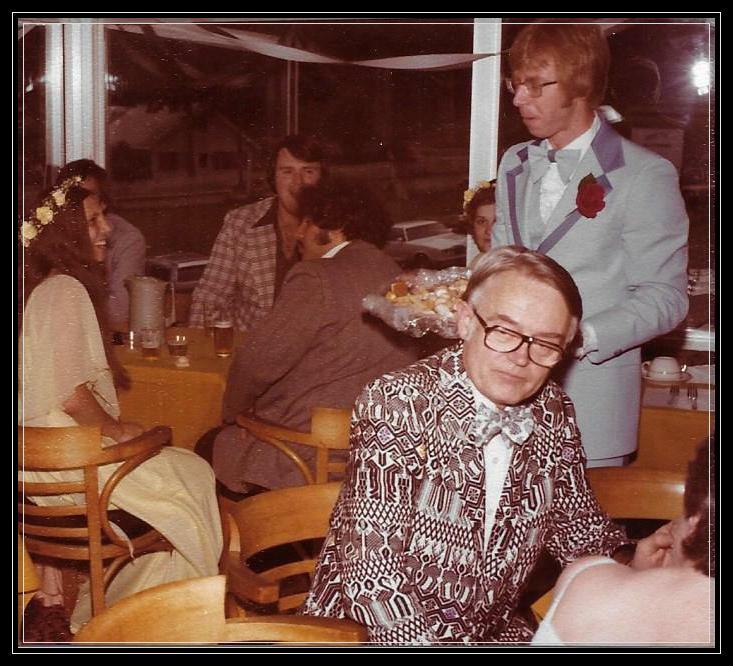 Dr. Gilmour at our wedding in 1978 looking rather fashion forward in his bold jacket, white shirt and mismatched bow tie. That handsome guy in the blue tuxedo is my handsome groom. What I learned from my experience with Dr. Gilmour was that we mustn't be swayed or discouraged by other people's opinions. I found out that Dr. Gilmour didn't just have the highest standards and work ethics, he also had the biggest heart. Days it snowed, Dr. Gilmour would call me at home at night to make sure I'd made it home safely.....even though he knew I took a bus most of the way home. He remembered me generously on Secretaries Day....even after he retired and I'd left state service to raise my family. When I got engaged, he gave me a cheese grater - the old fashioned metal box type and explained that I had to graduate into a Cuisinart because you had to be a seasoned wife and cook for something like a Cuisinart. He sent me my first Amaryllis one Christmas and a Gardenia one Secretaries Day - both after he retired. Yes, he had a rough exterior and he sure wasn't a pushover, but except for when he was smoking two cigarettes at a time while I took dictation....I loved him dearly and have so many fond memories of him and his wife, Myra. Dr. Gilmour moved to Florida when he retired. He invited us many times, but we never made it. I left Ag & Mkts on maternity leave just a few months after his retirement. His smoking caught up with him and he died of emphysema in 1993. What others perceived as a tough as nails dictator, I viewed as one of my greatest blessings, a fabulous boss and a kind and generous role model.....in other words, he was nothing at all like the man everyone's reaction described. Often when our kids begin a new school year and receive their teacher assignment, parents or older children will volunteer their opinions about that teacher. Sometimes their opinions are negative and discouraging. Our little students become filled with dread and apprehension and sometimes they find that they love that teacher and have no problems at all with them. All that dread and fear was wasted and served only to create unnecessary anxiety. Just like in many other areas of life, we need to listen to others but draw our own conclusions. We should not be swayed or have our opinions formed prematurely because we are each unique, and the truth of the matter is that what we put into a relationship affects what we get out of it. What an individual is like with one person may be completely different than with another. Do not judge people based on the opinions of others. Enter relationships with an open mind and an open heart. Give people the opportunity to show you who they are - firsthand. You might be surprised with what you find. I may have only worked for Dr. Gilmour for a couple of years but he left a lasting imprint on my heart and I will be forever grateful for everything I learned from him. I think God places people in our paths for a reason. We may not realize it at the time, and sometimes we're too busy to stop and take notice of the lesson(s) waiting to be learned. My challenge to you is to look at the people around you, the people that haven't accidentally landed in your path but have been carefully placed there, and try to figure out what they have to teach you. Who in your life left a lasting impression? Thanks for letting me share this story. Enjoy your weekend and come back soon for more Life As I See It.